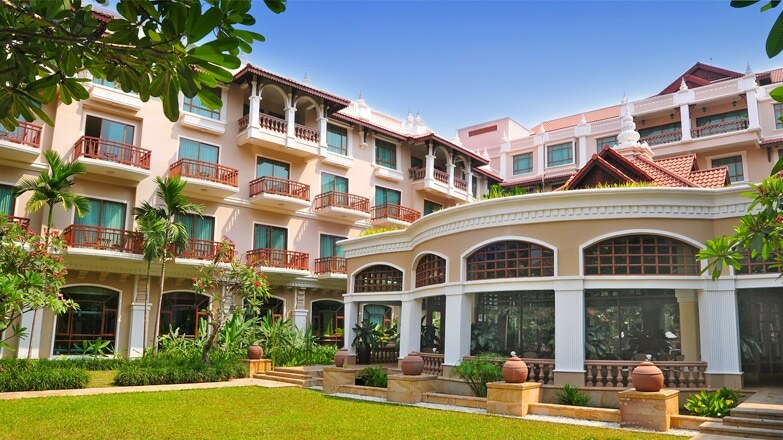 Sokha Angkor Hotel & Spa is the best valued 5-star hotel in Siem Reap. Golfers enjoy a 5-minute walk to Pub Street while staying at a golf resort oasis. The waterfall at the swimming pool is a centerpiece of the resort, and this is the only Cambodian hotel with a saltwater swimming pool. There is a large selection of dining options including an authentic Irish pub to settle up after a long round of golf; the best in Siem Reap, and Japanese teppanyaki.